Our recent projects page shows you what we can do! From emergency repairs to annual maintenance and safety testing, our garage door company does it all and we love to show our results! Check out some of the great work done by our technicians in Highland and the area. Customer Issue: Door got off track. Our Solution: As a result of this problem the door could not move. We carefully realigned its tracks and made sure the rollers were able to move along them effortlessly. 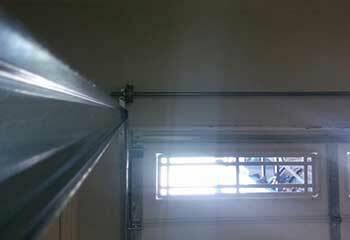 We then repositioned the door into place and made sure it was able to move smoothly once again without any issues. 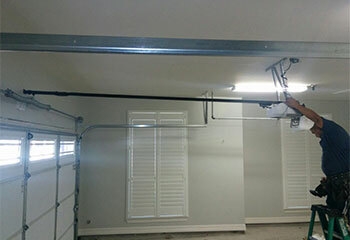 Our Solution: This customer had already purchased a new Marantec garage door opener because her old unit had broken down. She chose the Synergy 380 Belt-drive model. We quickly installed it for her and made sure the sensors were aligned correctly and the door was able to open and close smoothly. 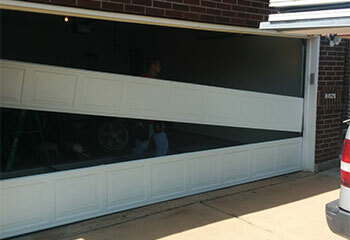 Customer Issue: Two garage door panels had been seriously damaged. Our Solution: Our team replaced both panels with perfectly matching replacements. Customer Issue: Malfunctioning Genie door opener. 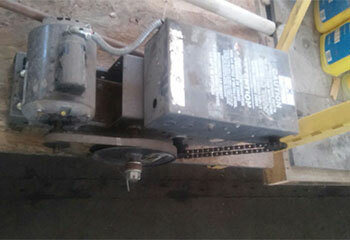 Our Solution: Our technician replaced the shorted out opener circuit board. 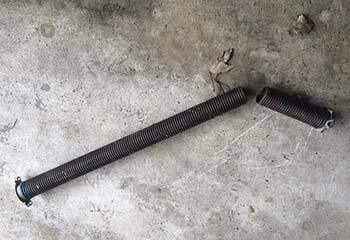 Customer Issue: A broken spring. Our Solution: We used stronger springs for the replacement and performed general preventative maintenance and balance test at the customer's request.